online. As Roger Gallo, CEO and president of EquipNet (Canton, MA) explains, these are timed events without an auctioneer. The buyer is able to place bids on any listing at any given time during the auction, which typically lasts between eight and 24 hours. Although live on-site auctions do still occur, he notes that they are waning in popularity. The attendees of these auctions typically have at least one thing in common: they’re looking for value. 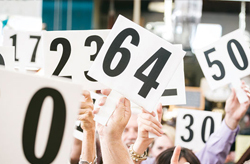 According to Octavio Espinosa, senior director of sales, marketing, and operations at BioSurplus (San Diego, CA), there are “really, really good deals” to be had at auctions. “The other benefit is that auctions can be great places to source parts,” he adds. The supply of equipment at EquipNet’s auctions comes directly from end-user companies, which often have maintenance records and a documented history of what the instrument had been used for, along with a service log history, says Gallo. BioSurplus runs two types of auctions, says Reid Hjalmarson, the company’s director of marketing. There are clearance auctions of their own inventory, where customers can find deals on both functional equipment and pieces explicitly advertised as “for parts,” and then there are liquidation auctions of functional labs. “That’s where customers really get incredible deals on really high-quality equipment that they know that is coming out of a professional working lab,” he says.